Breaking down L.A. county into 236 separate grids of 16 square miles, they tracked road accidents and weather for each hour of the day between 2016 and 2018. On dry days, they found that accidents tend to peak during rush hour, when there are more fender benders. But on rainy days, the researchers discovered most accidents happen during the middle of the day — when there's less traffic. It's counter-intuitive, but there's a good reason. "Anything that allows you to travel at a normal speed when it's wet is going to dramatically increase the likelihood of an accident," said Gabriel Kahn, one of the researchers on the project. He explained that drivers go too fast in the rain on an open road — and don't hit the brakes early enough. The most dangerous hour to drive during wet weather? Between 11 a.m. and 12 p.m..
Crosstown researchers also found that drivers are 80 percent more likely to have accidents when it rains. 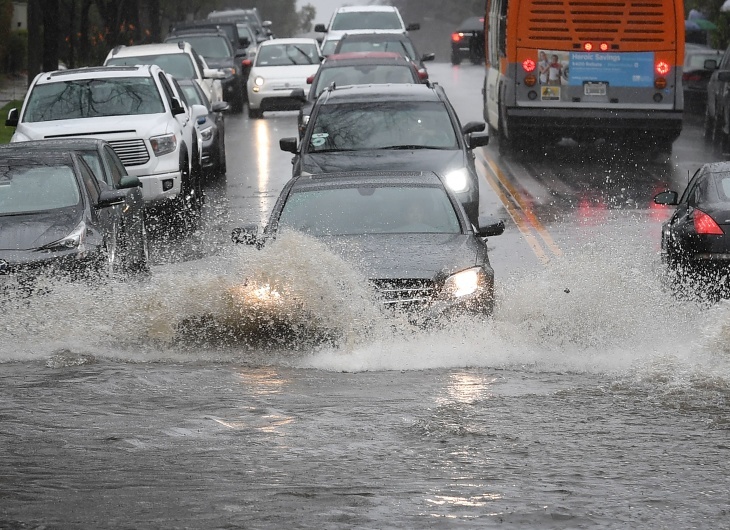 California Highway Patrol information officer Juan Galvan said on a normal day, during peak driving hours, his office might get 30 to 40 calls — but when it rains, that number can shoot up to 150. "It all comes down to speed," he said. "Sometimes the safe speed will probably be 40 miles per hour — but people are doing 50, 60, thinking they're still under the speed limit." Drivers often don't realize that they're going too fast for the wet conditions. 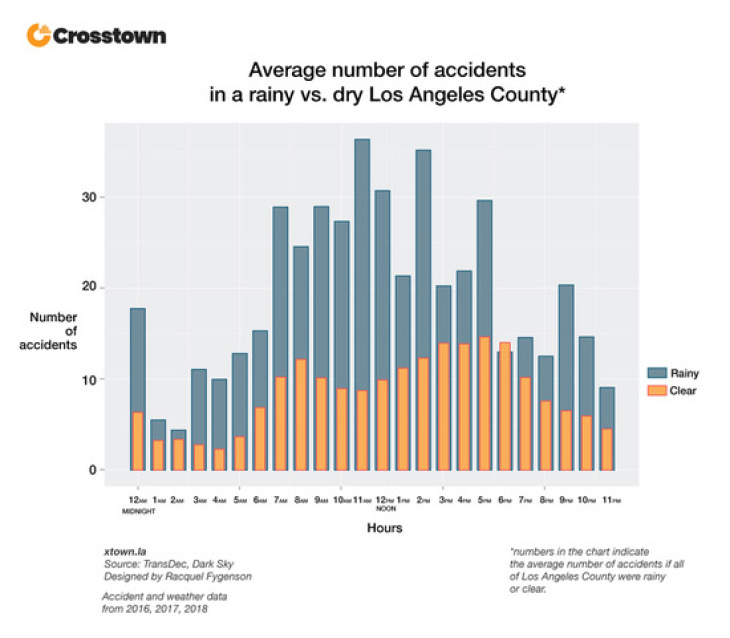 Crosstown data researcher Mingxuan Yue said it's generally hard to compare traffic against weather in L.A. County because weather can both vary over the region and change quickly. He said just calculating the rainy and sunny days in a year doesn't work. "Rain can happen at any hour of day and can disappear — or it can happen to a specific area and not to other areas in L.A. County," Yue said. That's why the team decided to break down the city into grids and monitor weather and traffic conditions per hour to pinpoint the data. So what's the safest hour to drive on a rainy day? Crosstown researchers say it's during "the thick of the evening commute" — between 6PM and 7PM, when traffic is already bumper-to-bumper. Kahn said there are also other variables besides weather to consider when evaluating accidents. As people move farther out from the center of L.A. County in search of more affordable housing, that means more people are commuting to work, which increases their chances of getting into an accident. And then there's the issue of drivers and technology. "They're increasingly distracted with phones, with other devices," Kahn said, adding that he has to put his own phone in the trunk of his car when he drives. But researchers say the best way to avoid accidents is pretty simple — just slow down.